Lacan's work is vast: twenty years of seminars, the long and difficult volume Écrits, several other articles and the Television interview we have discussed here. That means weeks, months, years of work and effort for the reader who wants to understand something about it. One could say the same thing about psychoanalytic treatment itself: so many years, so much time, so much money. Is it worth it? If it is worth dedicating so much libido to psychoanalysis, it's because psychoanalysis is not psychotherapy. If it were only to cure the neurotic symptom, if it were only to put an end to the neurotic complaint, it would be out of all proportion to do so. Psychoanalysis has therapeutic effects, but psychoanalysis is much more than psychotherapy. To interpret is only to designate what was said in what the subject articulated, and in that sense the desire of the psychoanalyst  you know that Lacan gave a key function to this desire  is first of all a desire for interpretation. We could say that the desire of the analyst emerges in the interpretation. 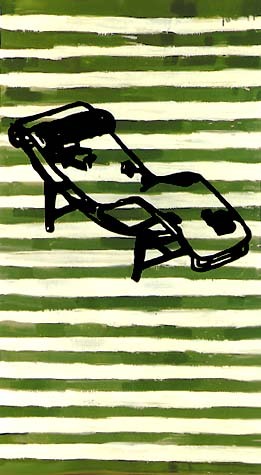 Illustration: Donald Baechler Corbu Chaise, 1982.